I’ve written about the Stratos device before, although I notice the video I embedded there has since become private. However, there is a newer and much longer video posted now where Stratos inventor, Marcus Reynolds, talks about it at the British Association for Performing Arts Medicine conference in 2013 (I believe). It’s a rather long video, so if you don’t mind spoilers here is my synopsis. First, bear in mind that this is essentially an infomercial. You can probably skip the first 60 seconds, since it’s really just soothing music with some scrolling text testimonials and description of what you’re about to watch. The device itself is interesting. It basically clamps on to your leadpipe or mouthpiece and places an adjustable piece against your chin. If you want to work on bringing your chin forward/your horn angle up I can see how this could be helpful. Reynolds also demonstrates how it can be used to play with less pressure, although I personally feel it’s better to try and identify what is making the player use too much pressure and fix that instead. I’m not sure how I feel about the demonstration where he keeps putting all the weight on the Stratos on his chin, keeping it off the lips. at 5:08 Reynolds intentionally sounds bad with almost no mouthpiece. He doesn’t elaborate on why it’s a good thing to practice this way, beyond the old trope about “letting the blood into the lips.” In my opinion, if you want to practice like this you should go all the way and simply practice free buzzing. At around 8:00 in Reynolds talks about a conversation he had earlier with one of the doctors attending his presentation. He mentions how practicing with the Stratos on and then removing it had the effect that the player wants to keep the chin forward. It’s curiously sort of a backwards effect, when you think about it. By placing something against your chin and pushing it back for a while you end up wanting to bring your chin even further forward. While not all brass players will actually want to bring their chin forward to play, this is one area where the Stratos might actually be very useful. And I have to gripe, of course, about Reynolds’ repeating the old myth that the air stream passes the lips and gets blown straight down the mouthpiece shank (starts about 9:14). Regular readers will already know about some of the evidence that’s available to see brass air stream direction. There may be some value to using the Stratos for some players, but I suspect that it’s not going to help a player learn to blow straight down the shank. In fact, this situation is actually bad for brass playing. If this is the basis on which the Stratos works, then it’s based on a false premise and should be reexamined. At £149.99 (about $250 U.S.) the Stratos device is not cheap and I probably won’t be getting one any time soon to teach with. I would also love to see someone research carefully and take a more objective look at how well the Stratos works and what it’s helpful for. There’s a lot of potential, I think, but I’m sure it’s not a panacea and might actually hurt more than it helps in some situations. Caveat emptor. Dr. Jim Chesebrough, who teaches at Keene State College, has a sabbatical project going on now where he’s traveling across the U.S. and taking lessons from a variety of different brass teachers. He’s video recording each lesson and then leaving some thoughts up about them on his web site here. It’s a very cool project and sounds like a great way to not only revitalize your own playing but also learn some new approaches and pick up some new teaching tricks. I learned about Jim’s project when he contacted me asking if he could take a lesson from me as part of it. I’m very honored to be considered, since there is some very august company in his list of teachers. Jim was interested in picking my brain about embouchure with me, so we spent pretty much the entire lesson going over that. It’s not something I always focus on, but it may be one area where the information I can offer is different from what he might get from other teachers. That said, I know he’s planning on grabbing some lessons with a couple of brass teachers that I’ve learned a lot from, Dave Sheetz and Doug Elliott. It will be interesting to hear what Jim learns from those guys and compare it to what I thought. In our lesson we ended up discussing some comparisons and contrasts of what Donald Reinhardt taught, for example, and some other more traditional approaches to teaching brass technique. Both Dave and Doug studied extensively with Reinhardt. Check out Jim’s web site from time to time. As he adds new lesson notes and videos I’m sure there will some great stuff up there. 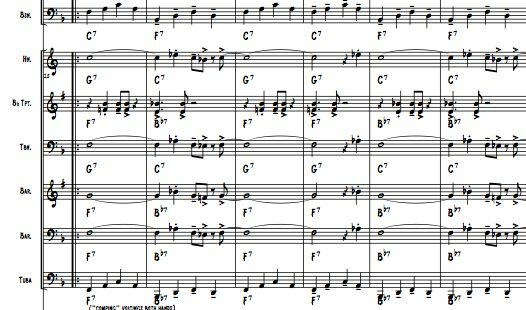 Three big band charts I wrote for middle school jazz bands are now available on PDF Jazz Music. All three of these charts include chord voicings for guitar and piano and sample bass line. 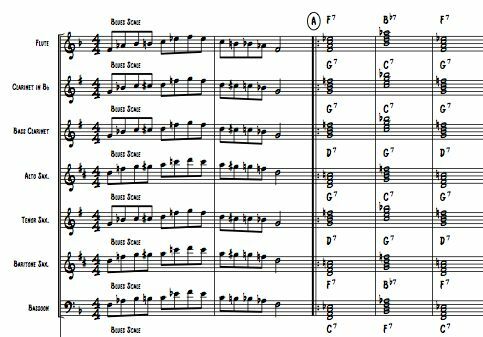 There are also some sample solos included, although each of these charts would be useful for introducing different improvisation topics to young jazz students. I wrote Nogueira Amarga for the Northview Middle School Jazz Ensemble, under the direction of David Wortman. It’s a bossa nova that is based around a two-chord vamp, making it an easy introduction to improvisation since the students can choose notes from just a major pentatonic scale or major scale. Blackhawk Blues was composed for Mary Jo Sparrow’s North Buncombe Middle School Jazz Ensemble. It also includes sample voicings, bass line, and solos. As you would guess from the title, Blackhawk Blues makes for a good introduction to blues scale, minor pentatonic scale, and blues form. Like the other two, Tyson Tunes Up includes voicings, bass line, and solos. I wrote this chart for Tyson Hamrick’s jazz band at Owen Middle School. This chart is a touch more challenging than the other two. Each of the horn sections gets the chance to play some melodies. This chart is based on rhythm changes and includes hints at other famous tunes that use the same chord progressions. You can view scores and hear recordings of these charts on my page over at PDF Jazz Music. One interesting things about the recordings of those three charts is that they were made with just 4 musicians. I had three friends play the drums, bass, and saxophone parts. I recorded all the brass parts and the piano on those recordings. Check out the following video of Jon Faddis performing in 1977, when he would have been only about 24 years old. It’s amazing trumpet playing, but take a close look at his embouchure formation and see what you would think if you didn’t hear the sound. We get to see Faddis taking a breath up close a couple of times and you can see how much he pulls his lips off the mouthpiece and has to reform after every initial attack. His mouth corners don’t look all that symmetrical, which may not necessarily be a bad thing, but his upper lip looks like it’s a little loose on his left side. It’s always interesting to see such great playing, even when you can spot things that are “wrong” with it. Of course it’s hard to argue with playing like in the above video. Now compare that to this video from 36 year later, in 2013. In this video you don’t see so much of Faddis pulling his lips off the mouthpiece when he takes a breath in. Instead, his lips stay in place on the rim and he breathes in through his mouth corners. His corners look more symmetrical to me in this video. There’s overall less excessive moving going around with his embouchure in this more recent video. Everything looks more stable overall. At least this is how it looks to me. I find the idea of being able to view great brass players’ embouchures early on in their careers and compare their playing later on to be an interesting avenue to explore. How do players in their early career compare to years later? Do players with more longevity tend to have certain embouchure characteristics or develop those features as they continue to play? And while I’ve mentioned Faddis in some other posts here concerning his embouchure type, I don’t think I’ve actually done a “Guess the Embouchure Type” with him. After watching the above videos, what’s your guess? Mine after the break. Beginning in the 1950s big band leader Stan Kenton developed an approach to jazz education that today is sometimes referred to as the “Kenton Clinic” model. The concept of it is simple – put students and professionals in the same band and have them play together. At one time this was really the only way available for young musicians to learn to play jazz. Prior to the 1950s you really couldn’t get instruction in jazz in school, you had to learn it by sitting in with professional bands and hopefully eventually getting good enough to be hired. Kenton realized by the 1950s that this model of music education was changing. There was less interest in jazz as pop music and fewer opportunities for young musicians to pay their dues by sitting in with local and regional bands. At the same time, many high schools and colleges had begun to put “stage bands” into their curriculum. Kenton recognized the opportunity and in 1959 he presented his first clinic at Indiana University. It was considered successful and led to Kenton expanding on his program. He would end up presenting over 100 clinics a year at camps and residency programs through the mid 1970s and developed educational materials and arrangements for student groups. Since then the Kenton Clinic model has been duplicated many times. As a music student I was able to attend the Birch Creek Jazz Camp first as a student and then later as a teaching assistant. The highlight of those camps for me was rehearsing and performing several times with the faculty big band. The experience of playing with musicians at a professional standard forced me to step up my playing to a higher level. Additionally, I was able to make connections with fellow students and faculty that led to other opportunities years later, yet another valuable feature of the Kenton model. I’ve always enjoyed the Kenton model and as the music director for the Asheville Jazz Orchestra I’ve wanted to do more of it. Last Saturday we were able to present a one-night Kenton Clinic to jazz students from Owen High School. The OHS band opened the evening with five charts, with a handful of AJO players sitting in (mainly to fill in for students missing for other school sponsored events that Saturday). I had been helping the students rehearse their music prior and they even performed one of my compositions, Truck Stop Coffee. But I hope the highlight for the students was getting to sit in with the AJO. I made sure that throughout the night we had good swinging charts for the students to play on. I also made sure that our encore was a chart the students all knew and we closed the night with a combined band. It’s my plan to repeat this clinic with other student bands and hopefully someday expand on it and present clinics that go over multiple days. The AJO has performed or given clinics at several educational conferences before, but we rarely have the opportunity to use the Kenton model at these. 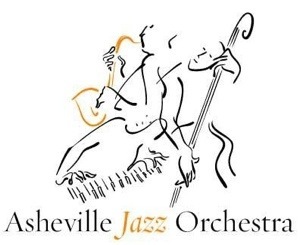 If you’re a band director around western North Carolina and interested in trying to help organize a Kenton Clinic with the Asheville Jazz Orchestra, please drop me a line at the contact link here. If you’re curious to learn more about the history of jazz education in the U.S., check out this presentation by the Thelonious Monk Institute of Jazz. A Wikipedia entry on Donald S. Reinhardt finally has been created. It’s fairly bare bones right now. If you’re a former student of Reinhardt’s please consider checking the entry out and adding necessary information. I was recently reminded about all the great jazz artists that appeared on the Muppet Show. They had their own Muppet Orchestra, of course, but I haven’t found a definitive list yet of who most of the sound track musicians were. Some of those muppet studio musicians had to play with some great jazz musicians. How would you like to be Ronnie Verrell, who plays Animal’s drum parts and have to drum battle with Buddy Rich? Frank Reidy supposedly played a lot of the saxophone and clarinet parts for the Muppet Show. He got to follow Dizzy Gillespie’s trumpet solo on Swing Low Sweet Cadillac. And while not really an example of burning jazz playing, the Sax and Violence sketch from the Muppet Shows reminds me of the Dizzy Gillespie’s bit with his big band performance of Doodlin‘ at the Newport Jazz Festival in 1957. Then there’s this version the Muppet Orchestra did of the jazz standard, Honeysuckle Rose. While the buzzing gets annoying to me, the interplay between bass and sax is fun and I like how the bassist covers the melody at times. There are other children’s television shows I can think of that often featured jazz or other art music. What are some of the ones you can think of? Post your YouTube links below if you can find them. I’ve got a fun gig coming up this Saturday (March 15, 2014). The Asheville Jazz Orchestra is playing our monthly show at the White Horse Black Mountain. I always enjoy playing with the big band there. It’s a great room for the big band and the folks there are easy to work with and very supportive of live jazz in western North Carolina. However, this gig is particularly exciting for a couple of different reasons. Playing with us for the first time on Saturday will be 3/4 of the rhythm section. Our usual guitarist, Chris Morgan, is playing. Kent Spillman (who I play with in the Low Down Sires) is playing drums. On bass will by Ryan Kijanka and Michael Jefry Stevens is playing piano. Michael did sit in with us once on an open reading session the AJO put together a while back, and he brought a couple of his own compositions for us to read through. And in case checking out some new players in the band isn’t incentive enough, the Owen High School Jazz Band, under the direction of Jason Minnix, will be opening up the concert at 7:30. When the AJO takes the stage right afterwards, around 8, Jason will be joining us on bari sax. Fans of the AJO would probably remember Tyson Hamick on tenor sax. As the band director at Owen Middle School, Tyson started most of the OHS students. We’re also going to be giving the students the opportunity to come up on stage during the AJO’s performance and sit up close to get the feel for what it’s like being on stage. We’ll plug in some of them into the AJO on a couple of charts too. As a student I found opportunities like that pivotal in sparking my excitement with playing music and I love paying that forward when I can. If you’re out in western North Carolina this Saturday, please come on out to support live jazz and jazz education. I just came across this neat video by “Paul the Trombonist.” He plays one chorus of blues either in the style of or an exact transcription by some of the greatest jazz trombonists who ever lived (born before 1943). Check it out.